You are here: Home / local noms / Local Noms: Lulu’s Local Eatery. Local Noms: Lulu’s Local Eatery. 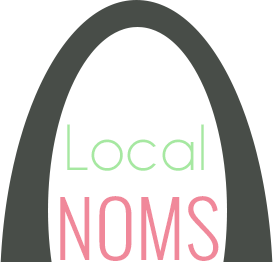 Note: For more details on what this Local Noms post series is all about, please see my little preview post. This installment of “Local Noms” features a local St. Louis business called Lulu’s Local Eatery. Let’s begin! 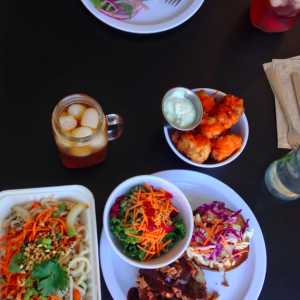 // Today’s “Local Noms” Review: Lulu’s Local Eatery. 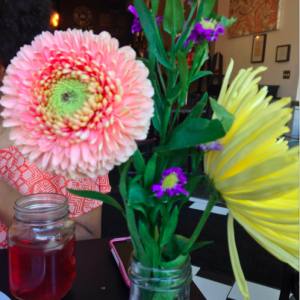 Pretty flowers adorn all the tables. 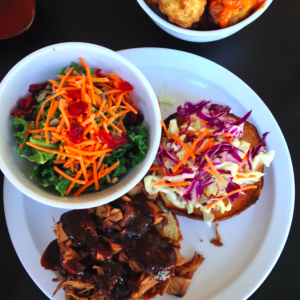 My meal of BBQ jackfruit with slaw and a side kale salad. Pretty rustic chic wall decor. Top view of my meal! I love the light that floods through the front windows. 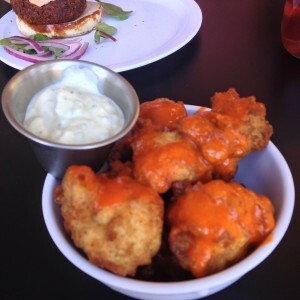 Buffalo cauliflower bites are the bomb.com! 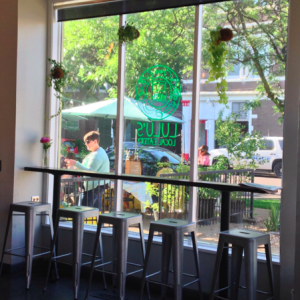 Close-up of the window facing Grand Ave. with Lulu’s logo. The building where Lulu’s resides, from across the street at Wyoming and Grand. Top view of my meal plus my friend Chanel’s meal (and my Buddha bowl to-go box, haha). + Background Details: I had been itching to visit Lulu’s Local Eatery for quite some time. I got there for the first time last year, and I’ve been back several times since then. Sometimes I like to order the food to go, or I will get a bite to eat from their food truck at the farmer’s market. + Restaurant/Shop Location(s): Lulu’s is located at 3201 S. Grand Ave. in St. Louis, Missouri, 63118. They also have a food truck, which is always at the Saturday Tower Grove Farmer’s Market, as well as other food truck events. The brick-and-mortar restaurant sits along the business district of Grand Avenue. + Initial Impressions: It’s a fun place to visit; when you first walk in, you’ll notice the rustic chic vibe of the place. 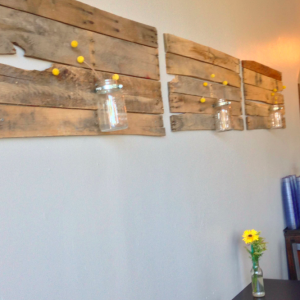 There’s reclaimed wood all over the place, plus fresh flowers on every table. [Personally, I’m a huge fan of fresh flowers everywhere.] 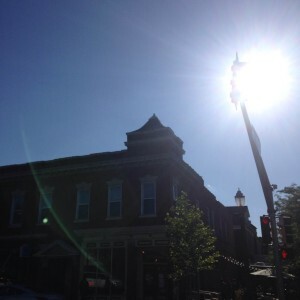 Plus, it’s located in an older building, so it definitely gives you that old world St. Louis vibe. The “old world” style that is stereotypical of St. Louis is, of course, something that I love. + Pros: Everything is super healthy and delicious. You might think that vegan food can’t be good, but this place proves you wrong. I’ve never had a bad dish here, and I have tried several meals from here. When I’m in the mood for some tasty vegan food, Lulu’s is where I go. 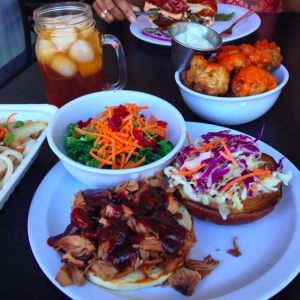 For this particular visit, I tried their jackfruit BBQ sandwich. It’s shredded jackfruit (which ends up being surprisingly similar to actual pulled pork) with Pappy’s (yay for more local places!) BBQ sauce on a pretzel bun. Pretzel buns are my favorite already, and then it’s topped with a fresh and crunchy slaw. I ordered a kale salad on the side, and ate some of my friend’s buffalo cauliflower bites. Finally, I finished off my meal with a fresh tea. I also ordered the “Buddha bowl,” which is an udon noodle dish that’s bursting with veggies for lunch the next day. Overall, it was tasty. My friend also enjoyed her sweet potato and black bean burger! + Cons: It’s a little pricey, but that is, again, to be expected with healthy and locally sourced food. That means that unfortunately, I can’t afford to go there constantly. But it is a really nice, healthy treat for me on occasion. Parking along Grand Ave. can also be a real pain, as it’s a busy area. The Tower Grove neighborhood is right around there as well, which, although it’s a pretty and old area, cars are everywhere! So be prepared for a little walk when you go there. Obligatory Disclaimer: I’m not a professional food expert in any sense of the word, nor am I compensated for any nice things that I may say about any of the restaurants I feature on my blog. All of my ramblings on here are just, like, my opinions, maaaannn. 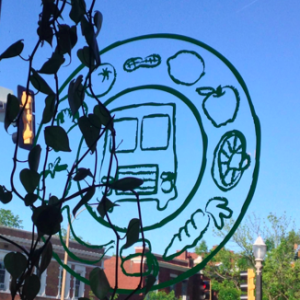 I just really like talking about and eating food, and I think it’s fun to feature local food establishments that I think are awesome, and if it helps them out in the process? Even better! Join me on my quest to EAT ALL THE LOCAL FOODS! Wait! What? You live in St. Louis! I can actually give you a hug! I love Lulu’s!